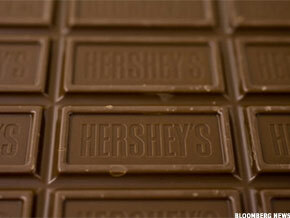 Is Buying Hershey Still Like Buying a Box of Chocolates? As great of a performance as this has been for Hershey, it was an even bigger learning experience. NEW YORK ( TheStreet) -- They say life is like a box of chocolates and you never know what you're going to get. Although the fundamental principle of that axiom often falls to the ranks of the underappreciated, it reminds me of the unpredictable nature of investing. It has always been a challenge, however, to say the same about packaged food giant Hershey ( HSY - Get Report) -- a stock I have always considered to be pretty expensive from the standpoint of its price-to-earnings multiple of 23. It seems Wall Street always has some different ideas when it comes to valuations, and I'm now realizing that this just might have been one of those stocks that I allowed to get away. Looking at the performance chart of Hershey over the past three years has made me realize I am not as smart as I think I am. Although this is not the first time I have come to this conclusion, it's even more egregious that this is the second time I have repeated this same mistake on this particular stock. Two years ago upon the completion of the first run-up of 50%, when the stock rose to $52 from $35, I felt there was no way that it would be sustainable. Hershey's performance in recent years should quiet the critics who say the stock looks sweet but doesn't deliver. To my delight it showed a slight dip (first red bar in the chart) and retraced slightly. But like an amateur, I got greedy and wanted more. The stock then showed some resiliency and recovered slightly, but only to repeat the same pattern (second red bar). Mind you, this was at the height of the financial crisis generating broad economic concerns -- the entire market had a bearish bias. So again, I stood idle waiting for the decline that never arrived. Since then the stock has gained another 50% to reach its current level of $68 as of this writing after having received an upgrade suggesting a price target of $78. What hurt my chances with Hershey (aside from some miscalculations) was the emphasis placed (too much so) on not only valuation but also relative/comparable analysis. What I had begun to notice several years ago, though, were the less-than-stellar earnings performances from within the packaged-food sector -- and from some prominent names such as Kraft ( KFT and my kids' new favorite stock, Kellogg ( K.
Although things have improved significantly from within the sector, there was no way to predict intelligently what would have been the end result -- particularly after almost the entire sector was forced to raise prices, including Hershey. From that standpoint, the company's management deserves a considerable amount of credit for not only having navigated the company from a difficult economic environment, but for having delivered an exceptional start to 2012 and, more specifically, its recent first quarter. In its most recent quarter, the company reported net income of $198.7 million or 87 cents per share on revenues of $1.73 billion, representing a 24% increase over the same period a year ago, when it earned $160.1 million while revenue rose 10% annually. Even more impressive, and rubbing salt in my wounds, is the fact that not only is this the third consecutive quarter of revenue increases, but the company continues to raise its margins year-over-year after inching up 1% from last year. It is hard to describe how impressive a performance this was, but realizing that the company doubled its revenue expectations (which were 5%) by reaching 10% while also improving gross margins, it really puts things in perspective. As great as these numbers were, it did disappoint some analysts that the company did not raise full-year guidance for the second quarter, resulting in a downward adjustment to 63 cents per share from 64 cents and down a penny to $3.13 per share for the full year. But be that as it may, this did little to restrict an analyst at Argus from upgrading the stock and adding a projected 16% increase in value to the shares to $78. As great of a performance as this has been for Hershey, it has been an even bigger learning experience for me as an investor. While price, value and various relative appraisal methods will always have a place in my model of stock selection, Hershey will forever stand out as one of the ones where the model failed. From a current investment perspective, it is still a challenge to think that the stock is anything but expensive at this level, particularly as Kellogg and Kraft (and for that matter Coca-Cola ( KO and Pepsi ( PEP are trading at much lower valuations.